We are one of the well-known names in the industry involved in offering high operational electro permanent magnetic lifter. The lifter is manufactured in compliance with the set industrial standards and thus, excellent in performance. It is free from any sort of defects. The functionality is simple. We offer a feature-studded range that is known for its quality performance and durability. Even if the lifter fails due to any reason, the plates will not fall. We make available the best electro permanent magnetic titling lifter UL for sheets at the most competitive prices. So, contact us today and place the order. Electro permanent magnets for handing in vertical or horizontal position. EPM lifting magnet is designed with the consideration of all industrial safety knobs. Therefore they are very compact light weight high strength and very reliable and safe in use. Electro perm magnetic lifter is combination of permanent as well as electro magnet power which is required to clamp the job or de-clamp the job. 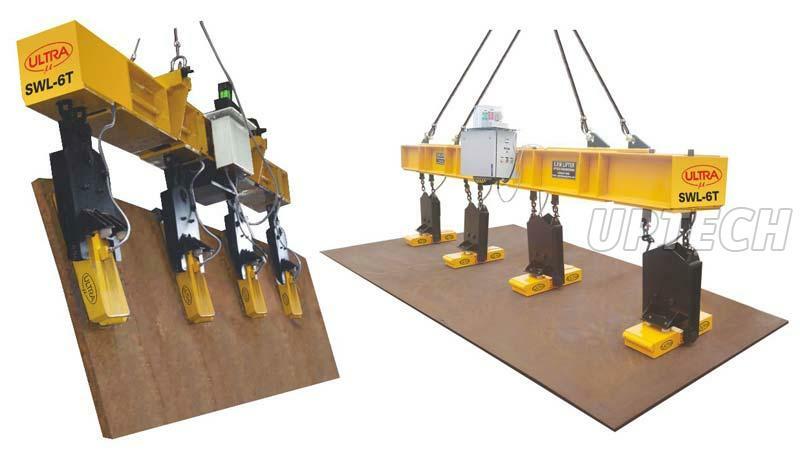 Lifted plate will not fail down even when electric power fails because Epm lifter requires power only for holding the plates and de-clamping the plates. So it is 100% safe for handling the plates. Continuous electricity is not required so it is having advantage of saving electricity over conventional electromagnetic lifter. Electro permanent magnetic lifter is used with combination of various magnets. At fix structure with provision of chain. So this will helps to handle plain as well as bend sheets in short it will take care of bend of plates. Safety interlock key to magnetized / demagnetized. Two buttons are to be press simultaneously with help to avoid chance of accident. "Inching" feature âï¿½ï¿½ when the magnets is switch On, it might lift more than a single plate. Inching operation reduces the magnetic power slowly such that additional plates, if lifted are dropped. This is used to make sure that only one plate is handled at a time. Lamp block âï¿½ï¿½ Displays the systems present state. Spreader beam fitted with suspension systems / control panel / indicative tower lamp etc. Most effective in ship building industry.